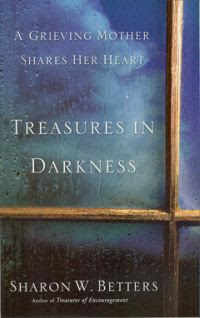 I was originally planning on reading Treasures In Darkness : A Grieving Mother Shares Her Heart and reviewing it over at 5 Minutes for Books. I was drawn to the title and what authors Sharon W. Betters would have to say about grief, but I really didn't want to open myself up in a review and share too much. If there is one thing I have learned in grief, its that you can become overwhelming to other people if you share about it too much. If after my dad and Landon's death last year I had devoted Reading to Know to honoring their memory then I would gamble my readership would be down and bloggy friends would be getting a bit tired of me. Plus, I just don't like to live my entire life online, ya know? However, then the book arrived in the mailbox and I read it and I knew I had too much to say. There was no way to read this book without sobbing and no way to write about it without having Kleenex (and worship music!) handy! Would that some one had handed Jonathan and I this book when his mom died almost three years ago! Betters shares so many extremely relevant and right-on-target truths in this book as she documents her Grief Journey after her son, Mark, died in a car accident at the age of 16. (It hit a little close to home.) I read this book during Bookworm nap times and sobbed as I read their family's grief story. Tears streamed down my face as I found myself identifying with so much of what she had to share - from being annoyed with friends who failed to support them in a way she thought would be most helpful, to feeling like you want to throw something across the room and smash breakables to smithereens to walking through a grocery store and wondering why everyone else around her looked like they were living a normal life (how dare they!?). Sharon Betters shares intimate parts of her journal in which she wrote down the questions she had for God (i.e., she was real with her readers, letting us see her innermost thoughts and pain). Now, one thing worth noting is that Sharon's husband is a pastor and, as we all know (because we do it to them! ), we think pastors are supposed to know everything and shoulder every kind of burden without doubting or flinching. After all, we suppose they know the truth of God's word better than any of us. Yet the Betters family were (pardon the pun) no better than any of us would be or are in the face of grief. They too were hurting individuals, made by God to love and be loved and to enjoy sweet fellowship with others - and to be broken when fellowship is cut off. The most perfect time (in my opinion) for me to have read this book would have been right after my mother-in-law's death when we took in my husband's two sisters to take care of for awhile, while my father-in-law took care of various items that needed tending to. I remember the night she died. I sobbed my eyeballs out. And that was the last time, for a long time, that I had the opportunity to do so because there wasn't time to grieve. Too many people needed looking after. Too many others were hurting. There were services to plan and clothes to be purchased for growing girls, people who needed to be fed (literally) and plans to make arrangements for. It was a crazy insane time. Then two years later my dad called Jonathan and I up and said the cancer was too far gone and it appeared as if his time on earth would be limited. He could barely talk because he was running out of breath. We flew down to be with him and upon arrival received a phone call that Jonathan's brother, age 19, had died in a car accident. He had fallen asleep at the wheel. We got back on a plane, torn because we knew time on earth with my dad was limited and yet Landon was gone. My father-in-law asked me on the phone about planning a service for Landon and handling a meal. My initial response was, "I cannot do this. I cannot do this for Landon. It hurts too much. I can't do it.....I can't do it...." (But I did it because it had to be done.) We had a service for Landon and I got back on a plane to go and be with my dad. We spent a month watching him fade from this world into the next. Only this time Jonathan wasn't able to be with me and so I refrained from grieving immediately because there was too much to do and I was being mommy to Bookworm1 at the same time. I couldn't fall apart. There wasn't an opportunity. It was the business of death, "as usual." And for the next few months we felt as if a black cloud of darkness was hovering over our heads. We were fearful that God was ready to smite us all and that Jonathan and I would be separated by death, or we would lose one of our children. Death of a different sort took over our fall months. If we hadn't wanted Heaven before autumn, we surely wanted it as we watched leaves fall off the trees. (But we'd have been happiest if God took our whole family in one fell swoop so that no one individual would be left alone.) Darkness. It was frequently hard to believe that there could be treasures. Betters knows of all of this and wrote this book eleven years after her son died. Eleven long years that I presently cannot even imagine. She wrote about the first Christmas and pulling out Mark's Christmas stocking and sobbing. I read those words and knew what she felt because I had just recently pulled out our Christmas stockings from the year before. Each stocking had names pinned on them so we would know which one belonged to whom. I hastily ripped off the names before I could memorize which stocking had been dad's and which had been Landon's. I don't want to remember them that way. I wanted Christmas to be Christmas in all of its glory - not shrouded in painful, wistful memories. Betters writes of having to go through family events such as weddings and the births and arrivals of grandchildren, knowing that there were relatives not around to appreciate the news. We've been there too. She shares relevant hymns and scripture verses and talks about how it is important that we learn good theology because if we get to the funeral home and realize that our theology isn't working for us, there's a huge problem. Our theology does matter and it needs to work when the hard times come. She talked about how it was one thing to speak from her head (and she did a great deal of that) in referencing God's sovereignty, but it was a process to work those truths to her heart. God IS sovereign. God isn't out to get us. He isn't punishing us for sins we committed, or sins that Dad, Landon, Helen or anyone else has committed. He isn't taking people away because they had reached perfection on earth. He is merely doing His good will on the earth and it just so happens we don't always understand what that is. But He is good. And He loves us. 1. I had made God too small but He is big enough. He loves me. I had stopped believing that. She had to write out the truth in her journaling that God loved her. She wrote it many times. Each time I read it, God was speaking through Sharon Betters and straight to me. "Carrie, I love you too. I do!" 4. She talks in this book about moving from misery, to mercy to ministry. We aren't meant to just "take whatever God does" and stay silent about it. She quotes her friend Susan Hunt in saying that whatever our circumstances might be - they are to be our platform on which we are to praise God. And sometimes praising is hard. There is no such thing as a private life -- "a world within the world" -- for a man or woman who is brought into fellowship with Jesus Christ's sufferings. God breaks up the private life of his saints, and makes it a thoroughfare for the world on the one hand and for Himself on the other . . . If through a broken heart God can bring His purposes to pass in the world, then thank Him for breaking your heart." Thank Him for my broken, wounded, miserable and shriveled up heart that doubts His love!?!?! That thought almost drives me to cursing (to be very honest about it)! Thank you, dear sweet Jesus for breaking my heart. Make me community minded. Do not let me think for a moment that my struggles are for my family only and do not let us draw so closely into ourselves that we are blinded to the world. Make me aware of the pain around me and make me fit to be profitable for You. She also shared the lyrics to the following song which has always been one of my favorites. It is a song that their church introduced to the congregation when they introduced drums into their worship set. Her son Mark played the drums. My dad was a worship leader. Landon also had musical gifting which he inherited from my mother-in-law. I'm quite sure they are singing this more loudly and happily than we are here but that thought puts a smile on my face. Consume all my darkness, Lord. But while I'm in it - show me Your treasures. May my family's life share Your story. If you or someone you know is grieving the loss of a person or something else, then I would strongly encourage and recommend that you gift them with a copy of Treasures In Darkness . Don't make it a big deal. Just hand it over to them and let them take it and do with it what they wish. This is one of those books that I'd really rather not need, but I did need it and I do need it. Scripturally based and full of genuine understanding, I cannot see how this book would fail to meet its mark. I don't envy Betters her loss and at the same time, I thank God for it, only because God gave her a message through her experience which has helped put me back into a right relationship with God myself. For that, I am truly grateful. This sounds like a valuable book. It sounds like we grieve in similar ways. Four years after my mom's death, I still find myself in tears missing her. Not as often as the first year. But I've learned to roll with it, experience it, and know the intensity will pass. One thing God does through situations like this is to take all that head knowledge and cause us to work it out into practical everyday life, so that when we then minister to others, it's not just theory, it's tested reality. Wow! What a great book. Thanks for sharing. My maternal grandparents died in 2006 within 2 months of each other. It was such a difficult time. What was more difficult was that my mom really didn't grieve Biblically. Much of it was sinful. What was worse was that she was completely insensitive to the fact that I was grieving for a loved one as well. Because I am merely a "grand-daughter" my grief didn't count. A great deal of her behavior changed a lot about our relationship. What a tough topic to write about, but you did it with transparancy and honesty. I was touched. This sounds like a book I need to read to help me understand those who are grieving. Since I haven't experienced a lot of grief I'm at a loss with what to do or say. Thanks for the recommendation. I've never suffered a loss that great, but I can relate to being terrified of losing what family you have. I have to admit that since I got married I fear often for my husband when he's not around. And now that I'm pregnant I'm often fearful of miscarrying or of complications during birth. I'm not sure how that specifically relates to grieving. Except that grieving is probably my greatest fear... I admire you so for all you've gone through. I'm glad you reviewed this. I think I'd like to read it. beautiful review and beautiful tribute. Echoing you on "Theology Matters" SO true! Otherwise we find ourselves falling into silly platitudes. I haven't thought about that song in such a long time. I was involved in worship ministry at one time and I remember when we first started using that song in worship. It is a nice one. Thanks for sharing yourself and this book. I have a friend who lost her only child and I'm always on the look out for books that can help me to be a caring friend.